A breakthrough in the much delayed process of buying Rafale jets was reached on Friday as Prime Minister Narendra Modi announced India will buy 36 Rafale jets from France in fly-away condition soon, citing "critical operational necessity". "Keeping in view the critical operational necessity of fighter aircrafts in India, I have spoken with the (French) president for buying 36 Rafale jets in fly-away condition as soon as possible," Modi said while addressing the media jointly with the French president. "President Hollande has extended full cooperation for our 'Make In India' campaign in the defence sector which is not just a programme but an ambition we have. India and France will together make defence equipment and also develop technology," Modi said. 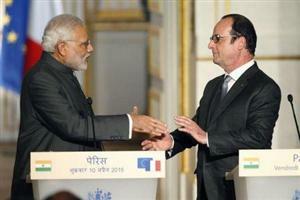 "Today we have taken strategic cooperation with France to a new level," Modi said in an address in Hindi. The IAF opted for the twin-engined Rafale in January 2012 over Eurofighter Typhoon of the European consortium EADS Cassidian after outsmarting F-16 of American Lockheed Martin, F/A-18 of Boeing, MiG-35 of Russian United Aircraft Corp and Swedish SAAB's Gripen in a global competitive bid floated in August 2007.